The Lockheed Martin stock price remained unmoved in morning trading today (Tuesday) on the release of Lockheed Martin earnings. Lockheed Martin Corp. (NYSE: LMT) earnings revealed that the world's largest defense company fell short of Wall Street's revenue estimates. The defense giant posted a $10.1 billion sales figure. Analysts forecasted a $10.3 billion clip. This was a 5.1% drop from last year's first-quarter numbers. Lockheed Martin did post earnings per share (EPS) of $2.74. That was above estimates of $2.50. But it was also a 4.5% decline from last year's EPS. 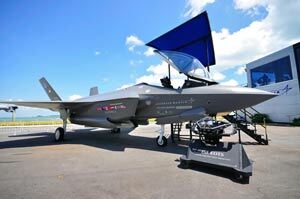 The Lockheed Martin stock price fell slightly – as much as 0.8% by 10:45 a.m. EDT. Fortunately, it was not enough to suggest that investors panicked and prompted a massive sell-off. And that's encouraging. A big contributor to the Lockheed Martin earnings miss on revenue came from a 7.4% decline in its aeronautics segment. If investors are ever hesitant to buy Lockheed Martin stock, it would come from negative developments on this front. Lockheed Martin derived 32.7% of its $45.6 billion in 2014 revenue from military aircraft. At about $14.9 billion in sales for 2014, Lockheed Martin is the No.1 fighter jet vendor in the world. It's just ahead of Boeing Co. (NYSE: BA), whose military aircraft sales totaled $13.5 billion in 2014. So it's understandable that any bad news in aeronautics could impact the Lockheed Martin stock price. But price movements have been rather muted this morning. If there is a sharper sell-off later in the day, it shouldn't sour you on Lockheed Martin. Let's take a closer look at those sales declines. Net sales fell for the C-5 and C-130. These are two aircrafts that are decades old – the C-5's first flight was in 1968, the C-130's was in 1954. They are inevitably going to be wound down. And, what's more, they don't hold the keys to Lockheed's future anyway. These declines accounted for lower net sales of $230 million. Net sales tied to the F-22 were down $50 million. They were also down another $70 million for the F-16. Once again, neither figure is too discouraging. The F-22 Raptor program was cancelled by Congress in 2009. It's only true value right now is the revenue Lockheed will generate sustaining the 187 aircraft that were delivered. The F-22 did prove to be a major blunder by the Pentagon and became a money pit. But those failures are a distant memory. They have long since been factored into the Lockheed Martin stock price. Declining revenue on these jets is almost irrelevant at this point.